Studies show that fostering a positive company culture means happier employees, which translates into more profit. USA Today recorded companies with happy employees outperform the competition by some 20%, and GrowthEverywhere has even found happy employees to be 12% more productive. At no point in the year is fostering company culture more important and impactful than it is during the holiday season. Unfortunately, some modern workforce trends can stand in the way of keeping employee morale high during this busy, travel-heavy time of year. Which trends in particular? How about the rises of teleworking and remote workforces. Today, more than ever, the number of remote employees is skyrocketing. According to FlexJobs, more than three million full-time professionals consider their home their primary place of work. Teleworking may offer sizable gains in employee efficiency and flexibility, but many business leaders have concerns it may detract from fostering workplace culture, not to mention that they won’t be able to include remote employees in holiday celebrations. Here are a few ideas for turning the annual holiday party into a massive remote celebration that includes remote employees and contributes to a culture-rich atmosphere. Mail presents and gag gifts to remote employees so they don’t miss out on the togetherness of an office gift exchange or the fun of a “Yankee Swap”. Try switching it up with a “Secret Santa” or baked desserts. Finding games to play with remote employees forces you to think outside the box. Create teams and get coworkers involved in a competitive game of Pictionary or charades. Try a gaming site where everyone can get together to play jeopardy or even sing karaoke. Sharing fun holiday photos of decorated work spaces, creating hashtags, posting videos from ugly sweater parties and gag gift exchanges helps illustrate your company brand. Taking your holiday party viral helps reinforce to existing employees how much you care about including them in year-end celebrations. Not to mention, it can help showcase how quirky and fun your organization is to prospects. The bottom line—a positive culture creates happy employees, which means a more motivated and engaged group of people and a more successful company. The value of company culture, even among your remote staff, is not something that should be taken for granted. 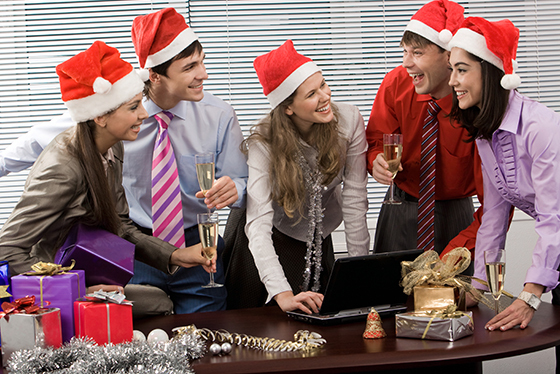 Take a moment this holiday season to host a “teleworking” party, and let your employees know how much they are valued. It’s the perfect time of year to start the new tradition and work toward creating a more positive culture.